If you are looking for a fun, low-impact way to get a good aerobic workout, this 38" mini-rebounder trampoline is the perfect solution. Featuring a 38" wide platform with 28" of landing space, this trampoline is designed to prevent spills and injuries associated with smaller platform trampolines. The thickly cushioned exterior pad acts as an additional barrier to prevent injury. The exterior pad is available in either blue or pink. Each trampoline contains 16 high-tension springs, making it sturdy and durable. The high-quality components and superior construction ensure you get a good cardiovascular workout, regardless of how much space you have available. The compact design allows the trampoline to be easily stored in a closet, under a bed or in the trunk of a car for on-the-go workout sessions. Best of all, this product can be assembled in five minutes or less! 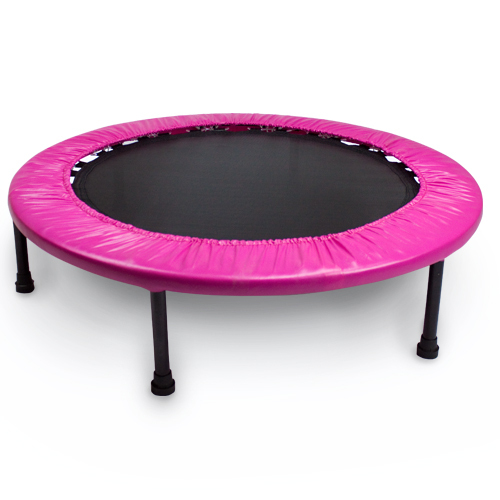 Mini rebounder trampolines are great for progressive exercise routines because they are gentle on the joints. Rebound training has been proven to increase bone density, detoxify the lymphatic system, increase balance and coordination, as well as strengthen and tone the body's core muscles. Unlike traditional exercises, workouts on a mini rebounder trampoline are fun and unique. With a number of routines available, you will never get bored and thus stay motivated to achieve your fitness goals. Whether you do side-to-side bounces, leaping tucks, a basic jog, a jumping jack bounce or a twisted tuck, you are sure to enjoy and reap the health benefits associated with these fun, progressive exercises. This item is designed to support a maximum of 220 pounds.